Welcome to Gotham City's heart of darkness. At the centre of the shadows rises Arkham Asylum, a festering depository of the vile, the dangerous and the delirious, with an ever-growing population courtesy of the Dark Knight. 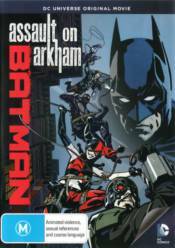 But when Batman foils the Riddler's latest caper and a crucial piece of evidence needs to be secretly recovered from Arkham, the solution comes from an unexpected source: a covert government strike team assembled from Gotham City's underworld. The assassin Deadshot leads the Suicide Squad: Harley Quinn, Killer Frost, Captain Boomerang, King Shark and Black Spider, a roster of rogues who know Arkham Asylum and its residents all too well. Get ready for an all-out assault as Batman faces a fearless legion of criminals with nothing to lose. Some will live, some will die and some just want revenge. It's an unadulterated adventure through the criminal mind in the latest DC Universe animated movie.